The Civilization strategy-centric podcast PolyCast (PC) is currently in its tenth season with more than two-hundred-and-sixty episodes released. During, and only during, the first season of PC was its “Cut!” side series in production, serving as a compilation of cut moments from episode recordings. For the first time since being recorded and produced nine years ago, the editions for Episodes 31, 32, 33 and 34 have been released. A combined runtime of 18m33s and featuring at least two of the four original regular co-hosts Daniel “DanQ” Quick, Wouter “Locutus” Snijders, Imran “Imran Siddiqui” Siddiqui and ”Makahlua”, they are the last of these episodic productions to be released. Beginning in October 2006, PolyCast has been a bi-weekly audio production in an ongoing effort to give the Civ community an interactive voice on game strategy; since 2011, its has been recorded live before a listening audience every other Saturday. Listeners are encouraged to follow the show on Twitter, and check out the YouTube channel for caption capability. Its two-hundred-and-sixty-ninth episode is set to be released on November 19th, 2016. Forum user chrissifniotis has published the first article in a series entitled ‘To Stand the Test of Time‘, which will focus on the history of the Civilization series, to celebrate the 25th anniversary of Sid Meier’s Civilization. The first article focuses on the development of Civ I and Civ II, released in 1991 and 1996 respectively. We have installed an addon that adds the ability to collapse/expand forum categories and widgets on forum home. 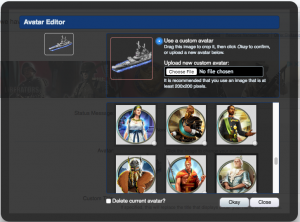 All Civ avatars are brought back and available for selection in the Avatar Gallery on the forums! In total there are 945 avatars available. Note that this feature doesn’t support categories so all the avatars are sorted by file name. To make the site more secure, we have installed SSL certificates and enabled HTTPS for both the main site and forums. This ensures all communications between your browser and CivFanatics website are encrypted and cannot be intercepted. We have also implemented URL re-writes so that visitors who clicked on HTTP links will automatically get redirected to the HTTPS version of the site. Common ground. Regular players Daniel “DanQ” Quick, ”Makahlua” and ”UberMarklar” are accompanied by fellow co-operative Civilization Vmultiplayer players in the seventy-seventh episode of TurnCast (TC). Entitled “Agree to Disagree“, its runtime is 09m59s. Snippets include but are not limited to feel bad, crazy talk, forgot it, stopped unexpectedly and funny now. Anno Domini is an ancient era full conversion mod for Civ5. Play as one of over 100 civilizations from the “Old World” from the dawn of time to the early Middle Ages. The mod includes a unique tech tree, with many new buildings, units and wonders linked to the ancient world. The civilizations come in themed packs, so you can customize who is in the random mix of opponents, and the themes range from “Enemies of Rome” to “Roman Britain”. Anno Domini incorporates it’s own version of various modcomps, including Piety, Rise to Power, Events and Decisions, Mercenaries and Tomatekh’s historical religions. If you wish to immerse yourself into a Civ5 ancient world battle, this is the mod to download and play!